8 bell pepper plants (Big Bertha, Marconi, Orange Bell, and Red Bell)--I had to buy these as starts, because my peppers weren't sprouting. Now I have 6 Marconis and 2 Long Red Cayenne starts that FINALLY sprouted and are coming along, so I suppose I'll pop those in containers, when the time comes. 11 bush beans (Dragon's Tongue, Buff Valentine Contender, and a mix from Burpee)--I also bought some "Soldier" beans, which are a very antique variety of drying bean. If I can find the time this week, I'm going to scratch out a bed for them and give them a whirl. If not, I'll just save them for next year. 4 rows carrots (Oxheart, Dragon, Little Fingers, and Short n' Sweet)--I'm also adding two more rows of carrots this week--one of Parisian Market carrots (little round ones, sometimes called "Thumbelinas") and one row of a North African carrot called "Muscade"
So aside from all of the culinary/medicinal herbs and the few flowers I've got going (marigolds, morning glories, zinnias, foxglove, black hollyhocks, viper's bugloss, convovulus, 3 kinds of poppies, Canterbury bells, snapdragons...) AND Jacob's sunflower forest (because we can't forget that), I think that pretty much answers the question of "What's growin'?" Time now for a hot, Dr. Bronner-y shower and a glass of bubbly. Tomorrow, rain. Thursday? Endless weeding. This flower opened near twilight on Beltane. I've been in the rain for the past fifteen minutes, angling for the perfect shot. 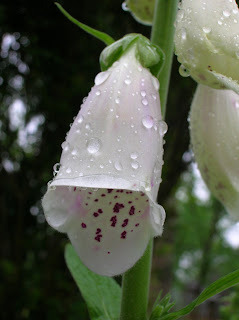 There's something about a foxglove that can make even the cheapest digital camera do something magical. As I snapped this photo, the little green tendril in the upper left extended down into the shot. I think we all know why that happened. So what's growing in the herb forest? Well let me tell ya'! a Canterbury Bells plant that was put in the bed because it didn't have anywhere else to go! Oh!! And how could I forget! On the little stone "plinth," I've set my potted Bay Laurel tree. I've been coveting one for years, and I managed to find one at the local "yuppie nursery." Soon to be added: Lemon Balm, Pennyroyal, Anise Hyssop, Wood Betony, Tibetan Gentian, and Horehound. What I love about my herb forest is that part of it gets partial shade and part of it gets full sun. All of it has wonderful, rich, wormy soil. It's just perfect, and I'm so thankful to see this fruition of the herb garden dreams I've been having since the age of 12. It seemed a long time in coming, but this was definitely the right time for it. 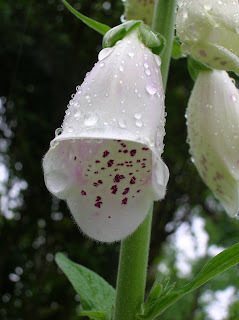 In other parts of the garden, the corn is sprouting, the beans are going wild, the peas are shooting skyward, the lettuce is lush, the carrots are digging in, the strawberries are blushing, and, just in time for Beltane, the foxgloves are preparing to bloom (photo forthcoming). I so love this time of year, even if I do have swine flu (or ebola or the bubonic plague). And now, I shall take some more orange juice and hyssop-horehound tincture and watch the rain fall soft upon my garden. The happiness it brings me is a known protection against all swine-avian-human flu virus "crises." The weather has been warm and wet--sunny days interspersed with severe storms and heavy, soaking rains. In other words, it's been PERFECT weather for ensuring that our gardens are flourishing. The peas have tripled in height since my last post--every morning, it seems as though they've grown a few more inches. I spent several happy hours yesterday digging and edging a circular bed and knocking together a fairly organic-looking bean tower for my Kentucky Wonder pole beans. Behold! Since the beans are going to be growing straight up (theoretically), I've sown a border of calendula all the way around the bean tower. Double your fun! Our first "harvest" (two Ozark Beauty strawberries) was DECIMATED by a hoodlum robin I saw hanging around the strawberry patch when I got home from work. I ran over to discover that two ripe berries had been torn from the vine and each given a sound peck. Jacob and I ate them anyway, despite the fact that they were sullied and shot through with robin spit (do robins even salivate? I'm not sure...). THEY WERE THE BEST STRAWBERRIES I'VE EVER TASTED. Hands down. There are about 40 more fruits on the vines at the moment, and if that robin thinks it's getting so much as a lick (do robins even have tongues? I'm not sure...) of anymore of MY (errr...OUR) delicious strawberries, it has another thing coming to it. The tomatoes (all 10 varieties!) are coming along beautifully, as are the eggplants. Cukes, pumpkins, melons, and squash are all sprouting in their Solo cups, readying themselves for installation into our wading pool beds. Yes! We bought cheap-o wading pools from Wal-Mart (quick! spit in your hand and make the sign against the evil eye!) 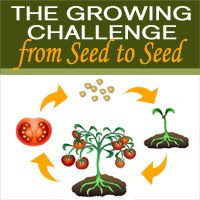 that (I've heard) are PERFECT for growing plants like watermelons, squash, etc. We shall see! Finally, we took a guilty break from small-scale farming operations to beautify our front yard today. It's a north-facing yard and much of it is in deep shade for the better part of the day--not ideal for clandestine front-yard veggie gardening, so we had to take a more traditional route. After spending our life's savings at Lowe's, we came home with some columbine plants, two "peppermint twist" hydrangeas, two French lavender plants, two giant urns, two hanging baskets, some New Guinea impatiens, and an 8-pack of some rather harried looking verbena. We dug two shade beds--one on either side of our porch steps--and planted the columbine and hydrangeas there. The lavender went into the urns, which I'm using to flank the entrance to our sidewalk (this gets sunlight). The impatiens went into the hanging baskets, and the verbena went into my little seashell planters on the front steps. All-in-all, an afternoon's worth of elbow grease COMPLETELY transformed the front of our house. I'm considering adding a couple of azalea bushes, as well as a circular bed with a birdbath or sundial. The wildflower plot on the "verge" has started sprouting, though to be honest, I don't remember at ALL what kinds of seeds I tossed out there...it'll be a surprise! Hopefully, all that color and loveliness will offset the fact that our neighbors have now broken out all of their front windows (and replaced them with trash bags!) and that they have now taken to sitting on their porch, chucking trash out into the yard. Class act! I'll try to post a picture of the front of the house here in the next couple of days. We finished up just as a storm was rolling in, so no time to get a decent pic. Hello hello. The weather has been so very lovely--highs in the upper 60s, lows in the 50s, warm, gentle breezes, and the occasional soft rain shower to water everything in nicely. Thanks to this nurturing gift of perfect days, things are flourishing here under the magic holly tree (which has, due to the ministrations of the arborist, become the magic holly TOPIARY). Two days ago, I dug and installed our strawberry patch out near the nascent herb forest. Because I didn't have the foresight to buy strawberry crowns online (thus affording myself a larger variety), I was stuck with what the Home Despot :) had to offer. They had ONE variety of June-bearing strawberry--"Cardinal"--and ONE variety of ever-bearing strawberry--"Ozark Beauty." I bought roughly 12 Ozark Beauties and 8 Cardinals. I then panicked at the fact that they didn't have a suitable home and spent the afternoon digging what I'll fondly refer to as my "strawberry concentration camp" (it's a little too small for 20 plants, I fear). The bricks came from a friend's backyard (she was thrilled to be shot of them). 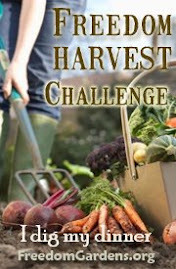 The dirt was full of luscious, monstrous worms, including a six inch long nightcrawler. Our back-of-the-property soil is SO wonderful (minus the large chunks of coal I keep unearthing!). I figure the bed space will be adequate for the strawberries this season, and that once they start shooting out runners, I can either clip them back to make them bushier, or just do some more sweating and callous-ing and expand the bed outward. 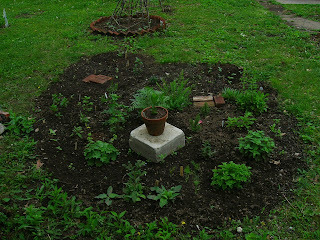 Behind me, in the lopsided circle, is the beginning of my herb forest. I've plenty of room to expand it (though it will lose its circular shape) as my herb seedlings grow up and are ready for transplanting. I'm thrilled to have so many size varieties to incorporate into my herb forest--from towering mullein and asphodel to creeping pennyroyal, and everything in between. I'm going to sink several large terra cotta saucers into the soil for butterfly/bee watering holes and I'm really hoping to salvage a toad from the Kroger parking lot (where they hang out under the lights and, inevitably, get squished) to live in the little moss toad house I plan on building. At left is the herb forest as it stand s (right now, it's a forest only to the tiniest of creatures). I KNOW it's totally UNIMPRESSIVE at the moment. There's catnip, feverfew, Russian comfrey, lady's mantle, motherwort, yarrow, St. Johnswort, viper's bugloss, canterbury bells (NOT an herb, I know, but pretty...and I had nowhere to put it after I'd dug it up from the old house! ), and two tiny rosemary plants that will someday be very big rosemary plants (or so I keep telling them. And folks--isn't that soil just LOVELY? Like I said, I know it's not much to look at right now, but see that ever-expanding list of "currently sprouting" plants on the right-hand side of this blog? Many, many of those are herbs, and a good majority of those herbs are going to become a part of this ever-expanding bed. Today, the Tibetan Gentian made an appearance (soooo excited!) as did the bittersweet nightshade. It's a climber, so I think I'll invite it to loop itself around the front porch railing. There will be some culinary herbs planted amongst the vegetables--basil, for instance, will go with the tomatoes (of course! ), as will the garlic chives. I'm also bringing along some marigolds that I can companion plant wit h the veggies for pest control purposes. Speaking of veggies...here's a look at the two raised beds we've built so far (including the ingeniously movable anti-cat fence Jacob constructed). On Monday, I planted 5 varieties of carrots (Imperator, Red Core Chatenay, Thumbelina, Oxheart, and Dragon) and some Bull's Blood beets, so I'm anxiously awaiting the first signs of green in that bed. Finally, my sugar snap peas are happily making their way up their chicken wire trellis. I love the fact that I can view them at ground-level by looking out my basement window! :) I can already tell that these peas will be far more successful than last year's planted-too-late-in-clay-soil peas which yielded ONE straggling plant that eeked out ONE SINGLE FLAVORLESS PEA POD beore dying. Also sprouting in that bed (though they don't show in the picture) are California and Flanders poppies. They'll add a nice pop of color, attract bees and other happy pollinators and nectar-sippers, and make a nice sedative tincture or tea once they've started blooming. Finally, an update on the True Unicorn seedlings--they're starting to take the shape of actual seedlings now, rather than just tiny green specks in the soil. I have many of them--about 15-20, I'd say, and I couldn't be more delighted. I bought a copy of a book by Richo Cech (Horizon Herbs guru) called Growing At-Risk Medicinal Herbs which is, perhaps, the only book in the entire world that offers detailed cultivation information for True Unicorn (as well as False Unicorn, which I've still had ZERO success with). I want to know how to treat these little beauties! As I type this, I've glanced at the weather to see that the NWS is calling for snow showers on Mon/Tues of next week. I know it won't kill anything that's currently outside, but it WILL kill my happy, spring-like mood if I have to break out the whale sweater and wool socks again. Speaking of killing things, I ROASTED my Monkshood seedlings. Every last one of them. I'm pretty damn pissed at myself--I woke up too late on a sunny Saturday and ran outside to remove the cover from my seedling tray only to discover that the damage had been done. The soil was STEAMING and the little Monkshoods (who love cool weather when they first start out...) were all keeled over. I nearly cried. I also fried the only English bluebell I'd managed to sprout. There may be a couple of Monkshoods coming up in another, smaller flat I'd started a little later in the winter, but they may have been snockered (aka drowned) in the recent rains. It's obviously not a life or death thing, but I'm still very sad. I'm pleased to know that I CAN grow monkshood...just sad to know that I can't try it again until next winter (which, really, I don't even want to think about right now). I may satisfy myself and buy an aconite plant from the nursery, but it'll feel a whole lot like cheating. Happy Old-World New Year to all!